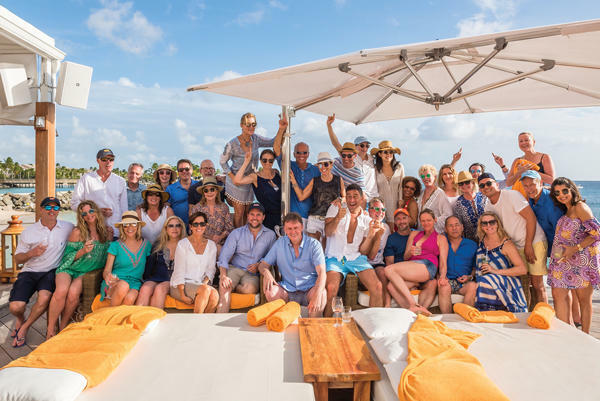 The Corcoran Group’s A team spent a rosé-soaked week in Barbados last month as part of the brokerage’s annual President’s Council retreat for its top 40 agents from New York, South Florida and the Hamptons. On a conference call from the beach, with a fresh round of cocktails in hand, Corcoran president Pam Liebman and New York-based agents Jessica Buchman and Scott Stewart dished on the revelry. Other favorites included a caviar and champagne happy hour held in Leighton Candler’s room, a five-course al fresco dinner at British chef Paul Owens’ restaurant The Cliff and a visit to Nikki Beach Saint Barth. Still to come was the traditional raucous catamaran trip with “a lot of tequila, a lot of good music,” which Liebman said is the favorite event. “What happens on the boat stays on the boat, if you know what I mean,” joked Buchman. But the work doesn’t stop for Corcoran’s best — not even in paradise. Before their departure, Liebman gave each of the agents mobile WiFi routers so they could stay connected. There’s a new destination every year, so repeat-winners, like Buchman and Stewart, don’t get bored. Last year was Ibiza, which Stewart said they’re “still recovering” from. “We spend all year biting our nails hoping we qualify,” said Buchman.